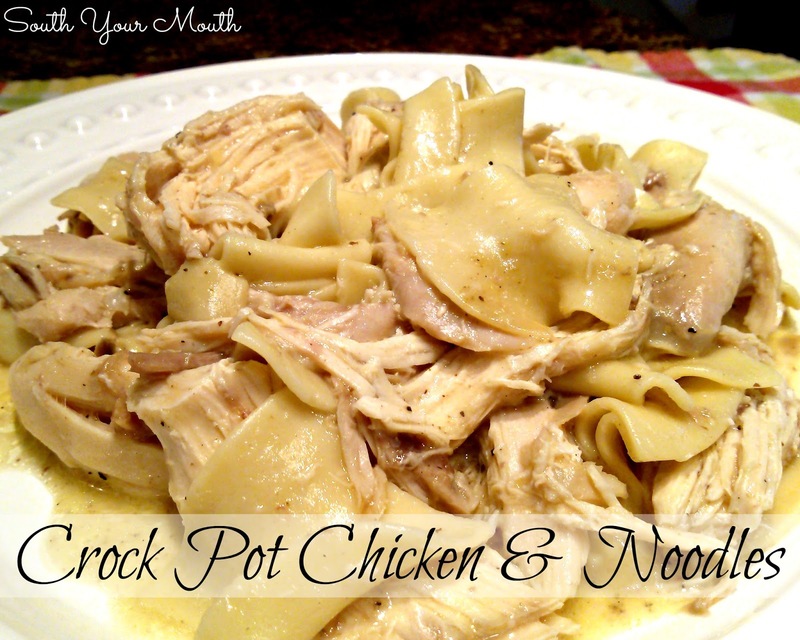 Slow-cooked chicken with egg noodles made easy in a crock pot. One of these days I’m going to set out to recreate my grandmother’s chicken and dumplings. I think I haven’t done it yet because I know it’s going to take several attempts to get it right. And I know mine will never be as good as hers. Nanny’s dumplings were not the traditional doughy dumplings but more like big, wide noodles. She would roll out her dough very thin, slice wide ribbons from it and then leave them to dry out on kitchen towels all day. Every surface of her kitchen would be covered in dumplings and you better not get your nasty hands near them or leave the back door open for flies to come in either. One of these days I will try. But it wasn't this day. This day I just made chicken and noodles. And while the noodles will never match her dumplings and she wouldn't have had to use the soup (the dumplings would have thickened everything up beautifully), the rest of the recipe is pretty dang close. And at the end of the day I still had a big ole pot of chicken goodness and a whole day spent thinking of my Nanny. Add chicken, 3 cups of water, salt, pepper, garlic and onion powder to a large crock pot. Cover and cook on low for 8-10 hours or on high for 5-6 hours or until chicken is cooked through and tender. Remove chicken from crock pot. I usually have to do this with tongs and a slotted spoon as the chicken will fall apart. Set chicken aside to cool a bit. Pour broth from crock pot into a large measuring pitcher (or whatever you have that will hold the liquid). Measure 5 cups broth and add back to crock pot. Your chicken will have put out a lot of liquid and you should have about 5 cups but if not, use water to make up the difference. Cover crock pot and heat broth on high until broth reaches a low boil. Add noodles, cover and cook on high for 10 minutes. Meanwhile, remove skin, bones, etc. from chicken and pull/shred chicken into bite-sized pieces with fingers or two forks. Add chicken pieces and cream of chicken soup to crock pot and gently stir until combined. Reduce heat to low and simmer about 10-15 minutes or until noodles are tender. This looks really tasty. Thanks for sharing. I am printing, pinning and making it soon! Love your blog! Like you, my Nanny made homemade noodles for chicken and noodles but usually on Thanksgiving. I remember well them drying all over the kitchen table and not being able to be in or even near the kitchen when they were out!! I am the only one in the family that she showed how to make so I am the keeper of the tradition but I don't wait all year to make them...we like them all year long. Thanks for all the great stuff!! What size can of cream of chicken soup are you using?, I assume the large can but yanno what they say about assuming! Thanks for all the awesome recipes! Love SYM! No, just a regular sized can. I think they're about 10 ounces. Can you use chicken breasts or tenderloin or must it be a whole chicken? Thanks!! You could but you'll need to reduce the cooking time by at least half, use chicken broth instead of water and add some butter (1/4-1/2 cup) to the stock. My mom made dumplings the same way - I've done it several times and it really isn't difficult, just time consuming. I've substituted with refrigerated pie crust - rolled out a bit to thin them - and it turned out pretty good. And if I was in a real hurry (i.e. must have chicken and dumplings NOW!) I've used rotisserie chicken from the grocery. I was taught by a wonderful cook to make the noodles, freeze them instantly, flat, on a baking sheet (instead of drying), put them in bags in the freezer for later use. She keeps bags on hand and therefore can make a batch of chicken and noodles without taking as long to do it. What chicken did you use..like a whole chicken with the legs on and everything or something different, i know it's a probably a simple answer and i'm probably just over-thinking but as much chicken that their is out there i want to make sure i'm using what you used. Hahahaha!!! I'm sorry i know that was such a "DUH" question...i'm a little too analytical!! But hey, I got the right chicken and the dish was GREAT! Thanks! You should be alright leaving everything as-is. You won't have quite as much chicken but that shouldn't matter too much. Good luck! Have you ever added some veggies to the chicken and liquids? I was thinking about adding some carrots in there! Carrots or celery would be great! I just made this recipe and it absolutely melts in your mouth! Everybody should give it a try. It is the best! Add frozen peas. It's great! I only have boneless chicken breasts- how many should I use, 2 or 4? would I have to adjust the other ingredients? Also, how many servings is this recipe? Can't wait to try this! I am so very grateful for your recipes that are just wonderful.. Thank you for your time and your thoughtfulness. I have made this for years. In a pinch you can do it much quicker with similar results by cooking the noodles and adding to a pan where you have combined the can of soup and a can of bones white chicken. The trick is in the seasoning! Don't be stingy with the pepper! If someone is not feeling well, this is the go-to recipe! I woke up this morning with winter weather warnings and wanted some chicken & noodles. I jumped up and started my crock pot with 3 leg quarters and decided to see how everyone does theirs. Your site was the very first one and the story is so warming. It truly took me back to "the good ole days". I could see myself running through the house with my "bigma" in the kitchen in her apron and and all floured up. That's for the recipe, but mostly thanks for the memory. I hope these are as good as they look and sound. I"m sure they will be.